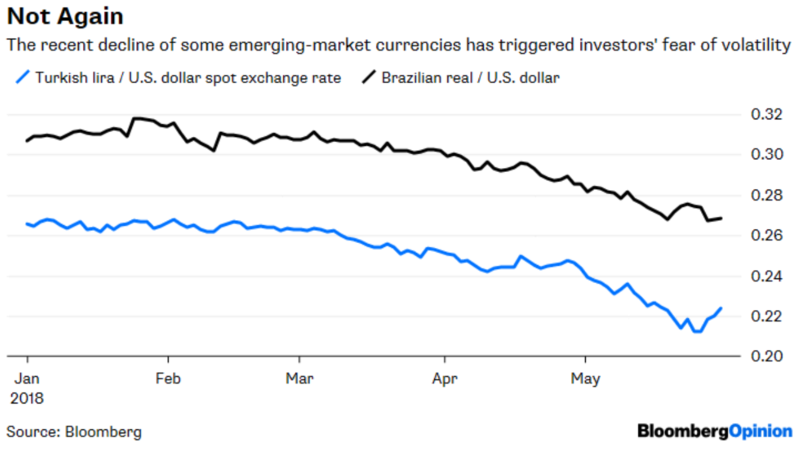 There’s a reason to worry about emerging-market currencies, but not the one investors have in mind. Some developing countries are stumbling, and their currencies aren’t taking it well. Turkey’s lira is down 16 percent against the dollar since its peak on Feb. 1 through Wednesday, and Brazil’s real is also down 16 percent since Jan. 24. The declines have recently spread to other EM currencies. The MSCI Emerging Markets Currency Index — a basket of currencies that tracks the country allocations in the MSCI Emerging Markets Index — is down 3.5 percent since its peak on April 3 through Wednesday. 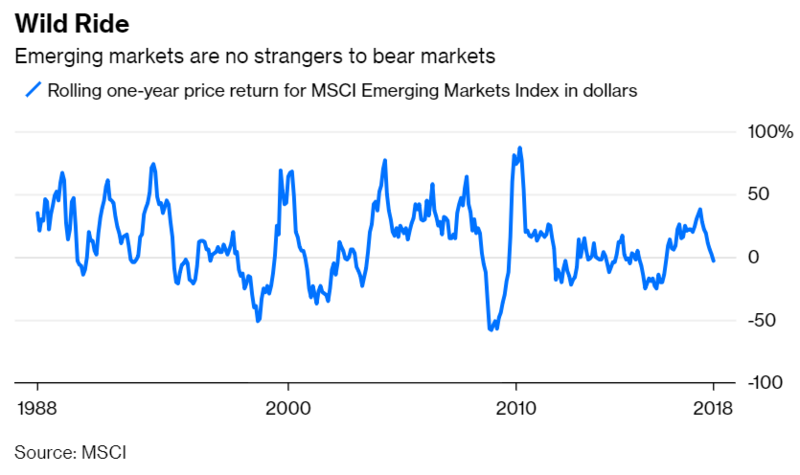 No, it’s not 2008 for emerging markets — at least not in the way investors fear. 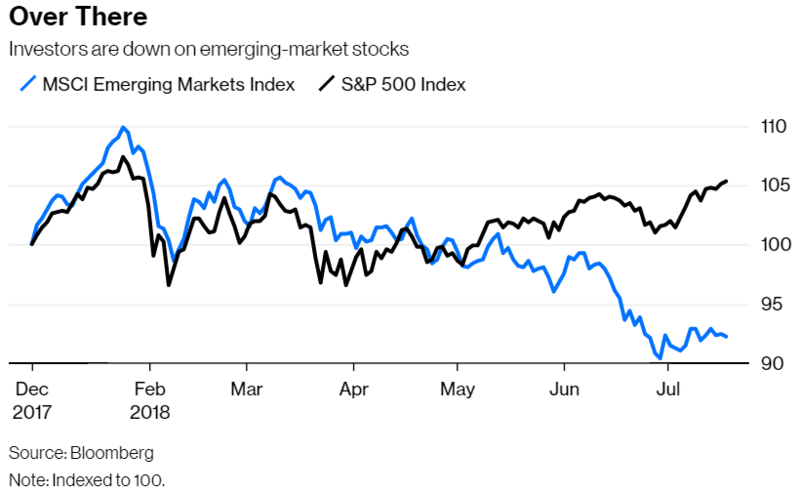 Harvard economist Carmen Reinhart stoked investors’ anxiety last week, saying that emerging markets are in worse shape now than during the 2008 financial crisis. Among Reinhart’s long list of concerns are a stronger dollar, mounting debt and various and sundry problems in Brazil, Chile, Argentina, Turkey, sub-Saharan Africa and the Middle East. In response, Bloomberg News looked at a group of developing countries and found that they are, in fact, worse off now than during the financial crisis in some important ways. The group, for example, has a modest current-account deficit, whereas it boasted a big surplus in 2008. The countries’ economic growth is also lower than it was during the crisis, and their government debt-to-GDP ratio is higher. It all sounds worrisome, but the relevance of Reinhart’s concerns to investors is questionable. For starters, most investors dabble in emerging markets through mutual funds and exchange-traded funds, and most of those investments are in stocks. 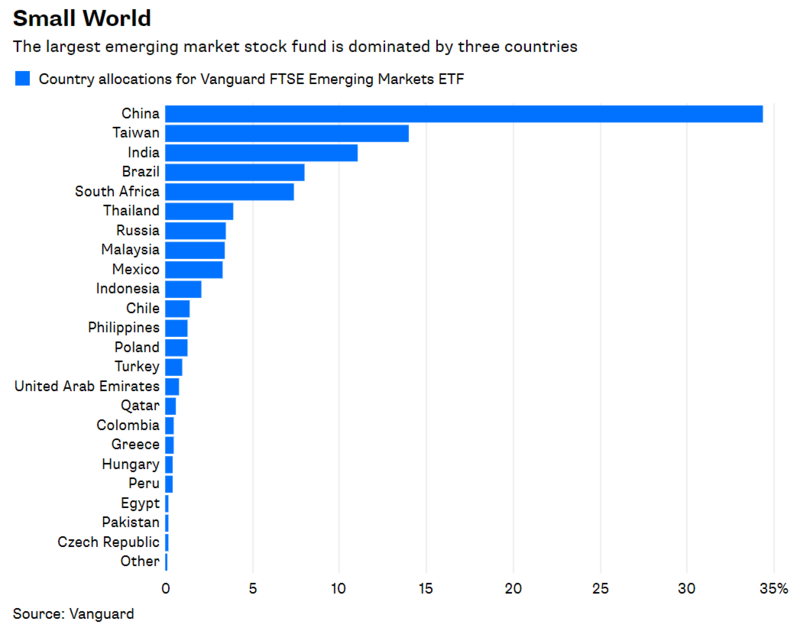 There’s $588 billion invested in emerging-market stock funds and $92 billion in bond funds, according to Morningstar data. With China in the midst of what appears to be a significant economic slowdown, investors are questioning their faith in one of the new century’s great growth stories. They shouldn’t abandon China just yet. First, some perspective. China was never going to string together an uninterrupted record of astounding annual growth. Despite all the hyperbole in recent years about China’s prowess and coming global dominance, not even China is exempt from the business cycle. But the current contraction will be followed by another expansion, unless you believe that China is going out of business — and no one who is a serious student of the country and its economy believes that. 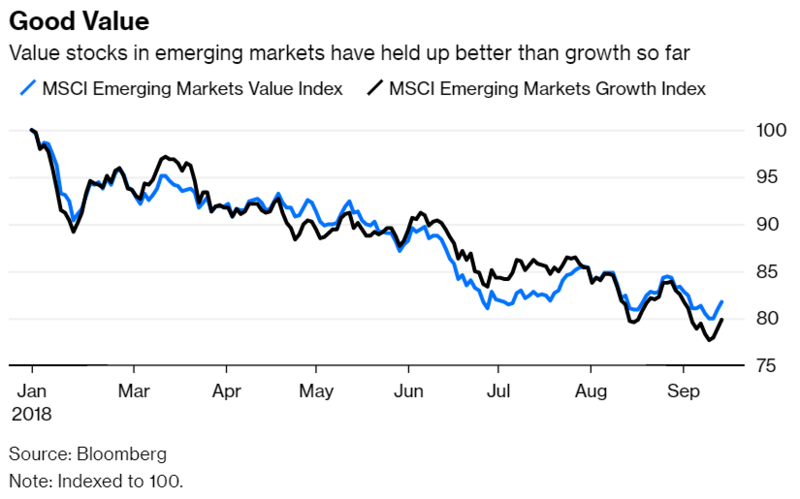 Everyone has grown accustomed to thinking about emerging markets as a monolith — a collection of undifferentiated countries aspiring to the big leagues, with all of the heft and stability of more developed economies. 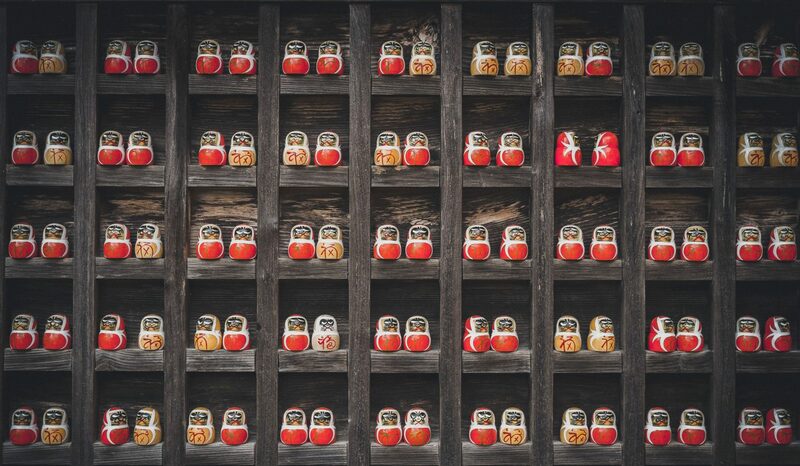 Emerging markets share similar traits, oftentimes the market prices them similarly, and so they all get wrapped into the familiar and popular one-size-fits-all basket called THE EMERGING MARKET FUND. 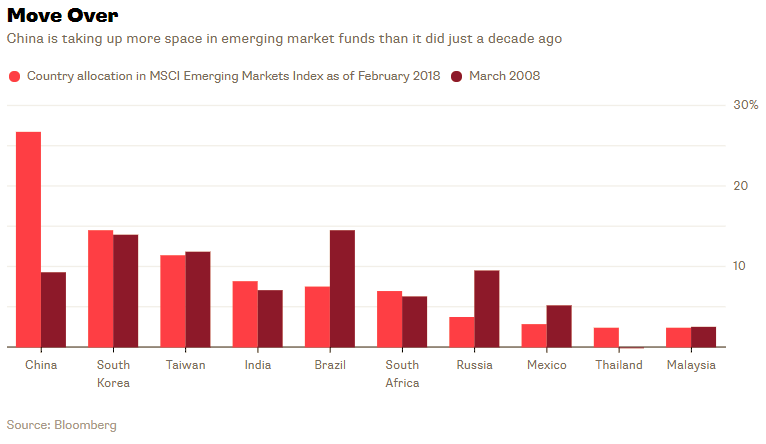 Today, that’s the wrong way to think about emerging markets.